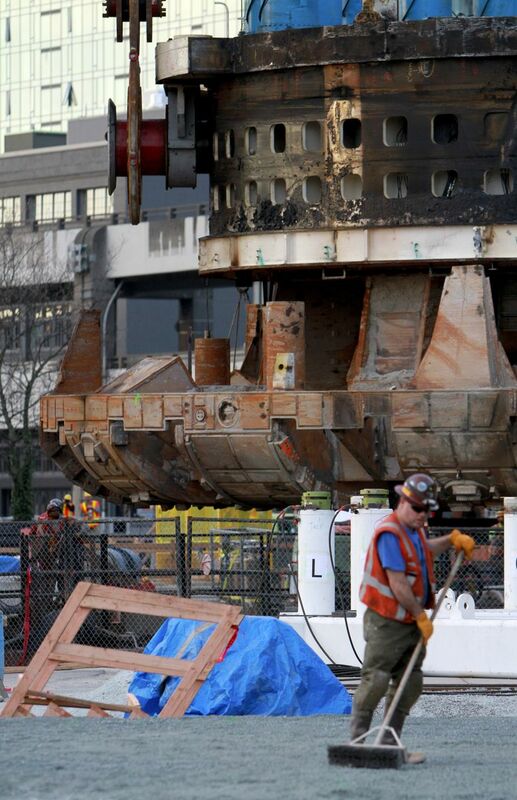 The front of tunnel-boring machine Bertha emerged from its deep access vault late Monday afternoon, after a trouble-free day of crane tests and hoisting. 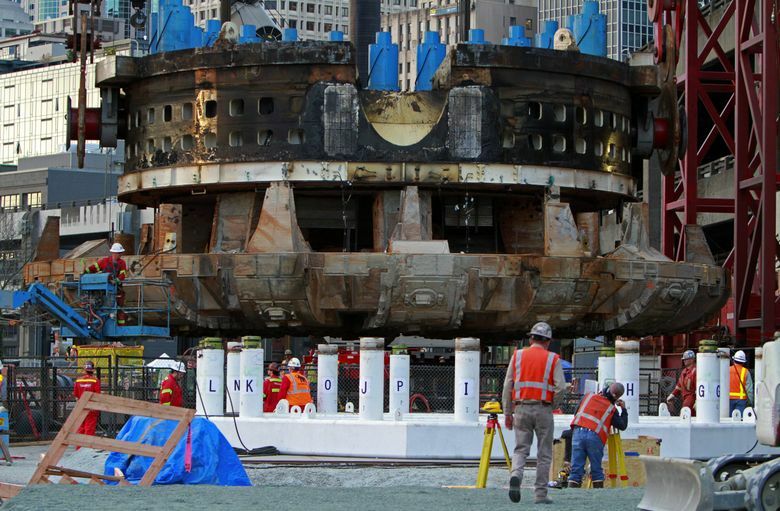 It is now resting on the surface of Seattle’s waterfront. 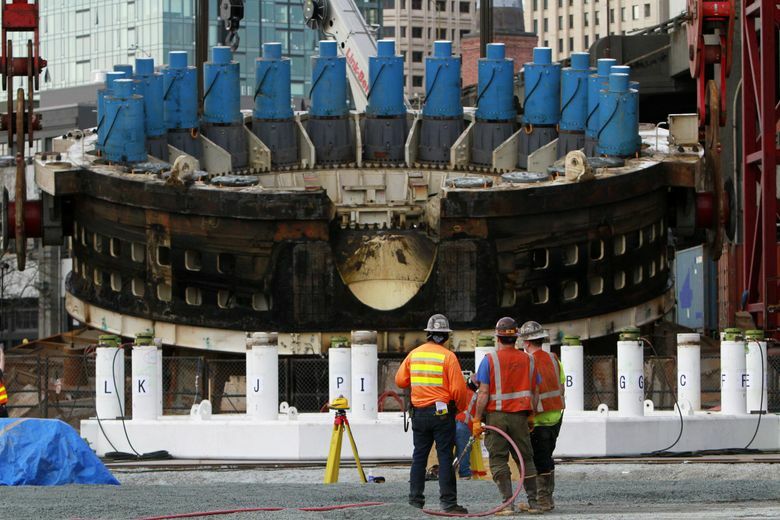 The damaged tunnel machine’s front end is finally resting on the surface of Seattle’s waterfront, after the 4-milllion pound load spent Monday night airborne. The operation was finished around 10:30 a.m. Tuesday, the state time-lapse camera images show. Workers are already preparing the ground mid-day for the next step, in which the ring-shaped bearing block and damaged seals will be dismantled from the rusty cutter head. The bearing parts will be plucked out and lowered onto another cradle 17 feet to the south, within a few days. The Dutch lifting company Mammoet originally planned to set the cutter drive on its white repair frame Monday night, but halted work around 9 p.m. The team chose to stop for the night, and untertake the precise lowering phase fresh in the morning, said Rachel Blomker, a spokeswoman for Seattle Tunnel Partners. Jeroen Van Kooperen, the project director for Mammoet, went home exhausted but grinning, after the near-flawless hoist that began around noon Monday. Red-suited Mammoet crews, Hitachi workers in white, and local STP workers in orange posed for a group picture next to the load. 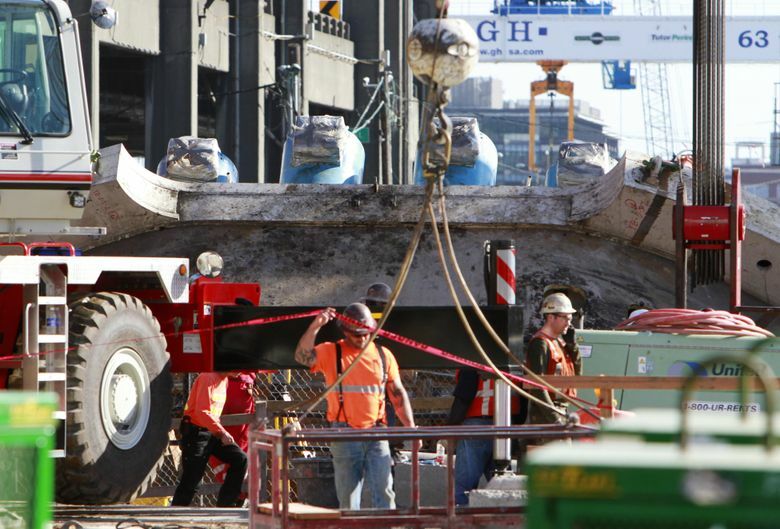 The move went so smoothly that Mammoet decided to turn the cutter face downward before Bertha’s front end even exited the access vault — instead of waiting to get the whole 57-foot-diameter piece above ground level. This move saved a couple hours, said Chris Dixon, project manager for Seattle Tunnel Partners, which is trying to resume the long-stalled bore to South Lake Union by August. 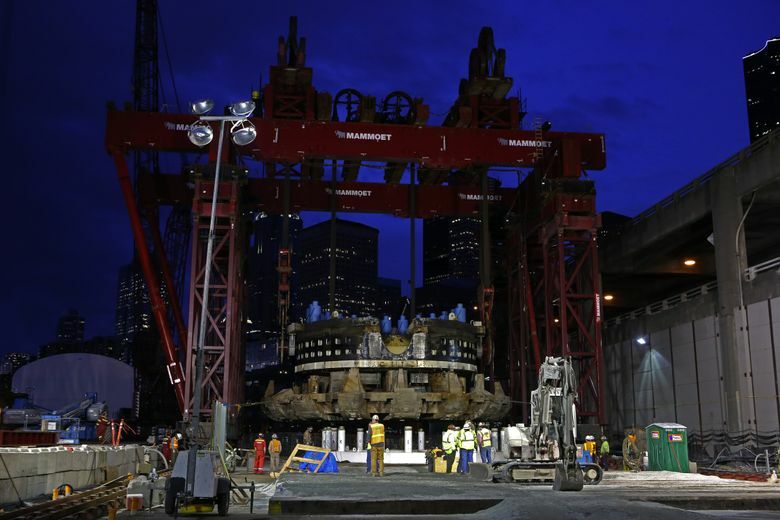 The scuffed and rusty disc-shaped front end of tunnel-boring machine Bertha emerged from the ground Monday evening, pulled from a 120-foot-deep vault so it could be repaired. The process went smoothly by all accounts, with the 57-foot cutter head and drive assembly rising about four or five inches a minute, pulled by some seven miles of cable. 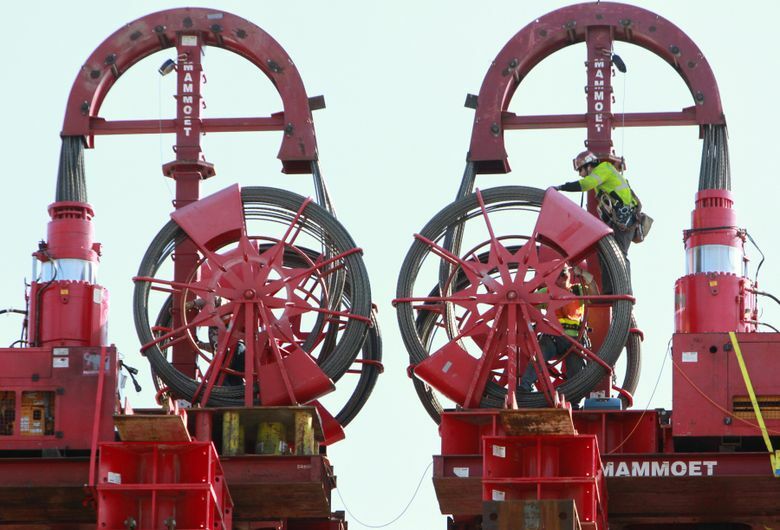 Mammoet, the Dutch lift company, decided to rotate the 4 million pound load a quarter turn while cables were still bringing it up within the deep access vault — instead of rotating it later Monday night as initially planned. 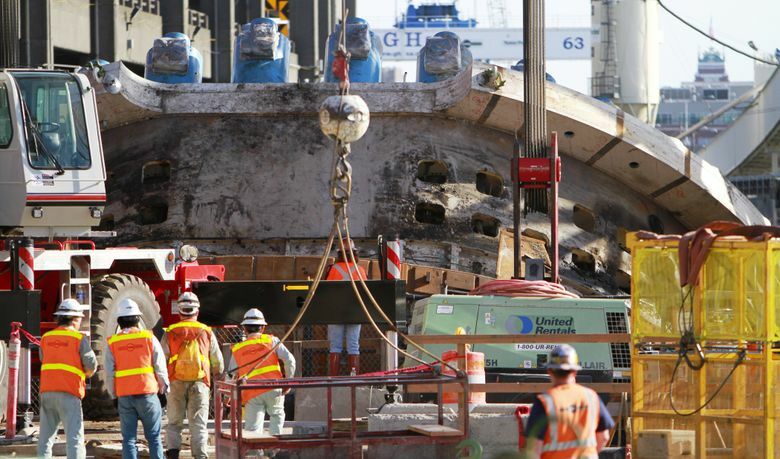 Otherwise, the top of the 57-foot cutting disc would have risen as high as the top of the nearby Alaskan Way Viaduct. “By doing it on the way out, they were able to save some time and they were able to keep the center of mass lower, which is always a good thing,” said Matt Preedy, deputy Highway 99 tunnel administrator for the Washington State Department of Transportation (WSDOT). As the cutting parts emerged about 4:15 p.m., viewers could see a big notch in front, where divers entered the cutting area to do repairs underground. Also, there are temporary knobs on either side, where the crane cables held the piece. Preedy said Mammoet, Seattle Tunnel Partners (STP) and tunnel-machine maker Hitachi devised a good lifting plan and did an excellent job carrying it out Monday. Meanwhile, behind the scenes, welders already were adding reinforcement steel rods and plates, to stiffen Bertha’s front end. The old bearing will be replaced with a heavier one that needs support, and Hitachi may well have decided to make the drill stiffer, as a margin of insurance against future trouble on the route from Sodo to South Lake Union. About a month ago, STP project manager Chris Dixon said he hoped to have the huge piece out by March 31, and barring some disaster, should make that goal — a sign of progress after STP has missed many others. Pit excavation began last May, and STP initially aimed to restart digging to South Lake Union this past fall. But many difficulties emerged, including groundwater pressures and the need to add extra grout to the walls of the 120-foot-deep vault, near South Main Street at the waterfront. The four-lane, $2 billion toll tunnel is now predicted to open in late 2017, a couple of years past the initial schedule. Preedy emphasized the machine needs to be disassembled, inspected and repaired before WSDOT can assess whether STP’s schedules are solid. The contractors intend to resume mining northward in August, but even Dixon has called that date aggressive.